Missy wants an alligator for her birthday, but it's not going to be easy to convince her mother. I Want an Alligator is for everyone who ever wanted a pet they shouldn't have. A fun, interactive read for children of all ages with a happy alligator ending. Children are often curious about people who appear different than they do. They ask questions or loudly point out what makes others not look the same. This can be embarrassing and unkind. 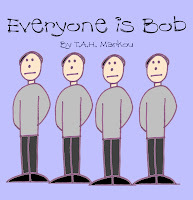 Everyone is Bob is a book with a subtle message that if everyone were the same, the world would not be an interesting place. Simple illustrations from round people to a person in a wheelchair, as well as the complications of marriage if everyone was Bob, present a humorous view on what it would be like if all people were the same. Teach your child to appreciate differences and even celebrate them with Everyone is Bob. -www.teachpeacenow.com listed Everyone is Bob on their Summer Reading list to expand children's thinking about fairness and justice. -Author Joan Koster cites Everyone is Bob in her book Growing Artists: Teaching the Arts to Young Children in a Teaching In Action Section written by Hillary Clark, a first grade teacher as a way to show children how boring we would all be if we were the same as all the Bobs in the book.